Focusing magnifiers for photography are similar to jeweler's loupes with some exceptions. As a rule, just like loupes, these instruments have no handle. The defining characteristic of these magnifiers is that they are designed only to image what they are aimed at, or placed against, and do not allow stray light to enter. They were used to examine photographic negatives and also for helping with focusing of old cameras against a ground glass screen. At first glance they might appear to resemble an insectascope or botanical magnifier, but can be recognized by the fact that there is no way for light to enter from the side; light can enter only when passing through the object it is aimed at. 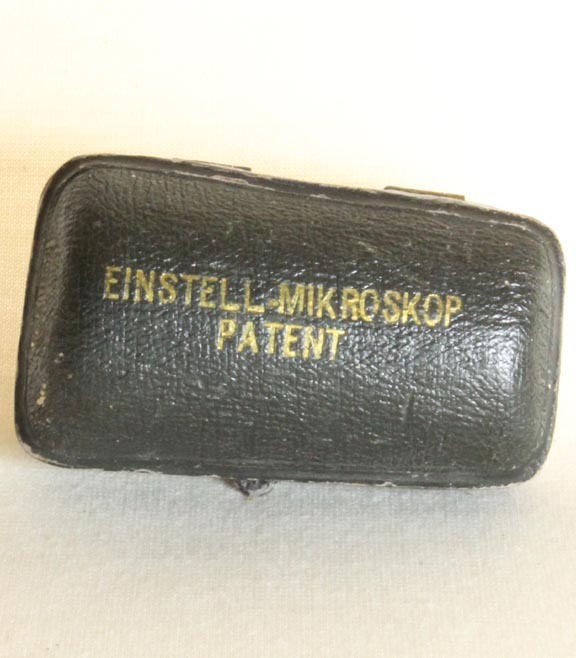 Some of these were designed to actually come into contact with the subject, such as film and in these cases they may have a rubber end such as is seen in the Einstell Loupe example on this site. Although variants of these were made well into the late 20th century, the ones pictured here are from the 19th and early 20th century. 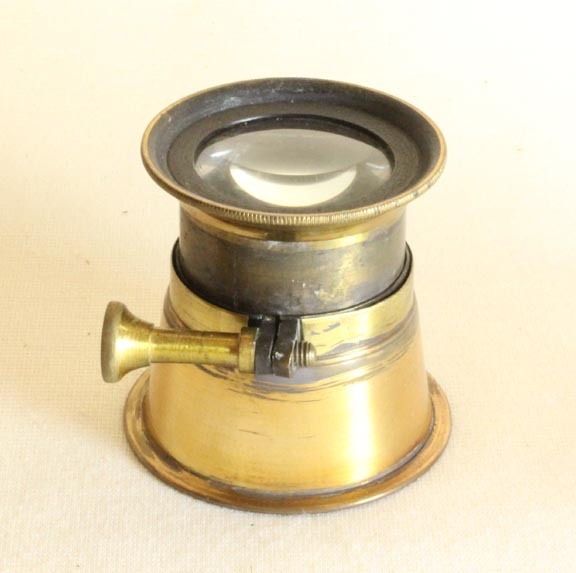 This is another late 19th to early 20th century photographic magnifier. Its focal length/focus can be locked with a clamp. 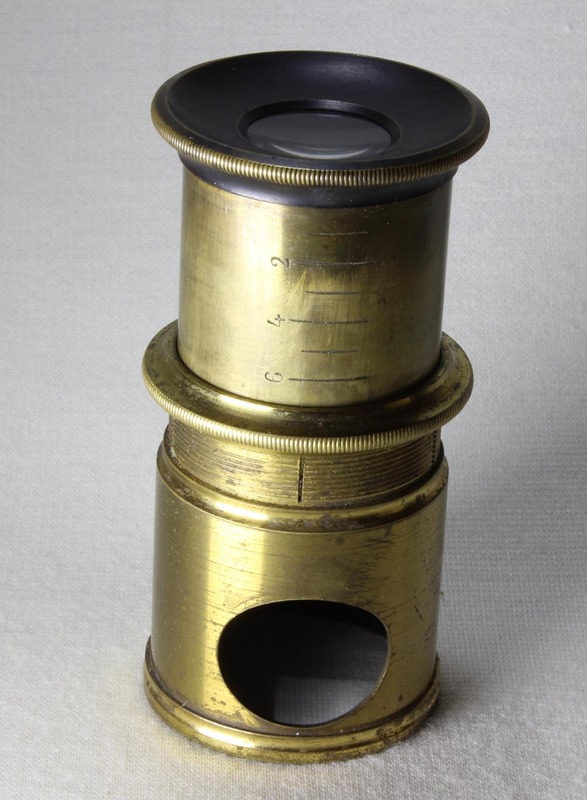 This is another late 19th century photographic magnifier with a coarse spiral focusing mechanism. 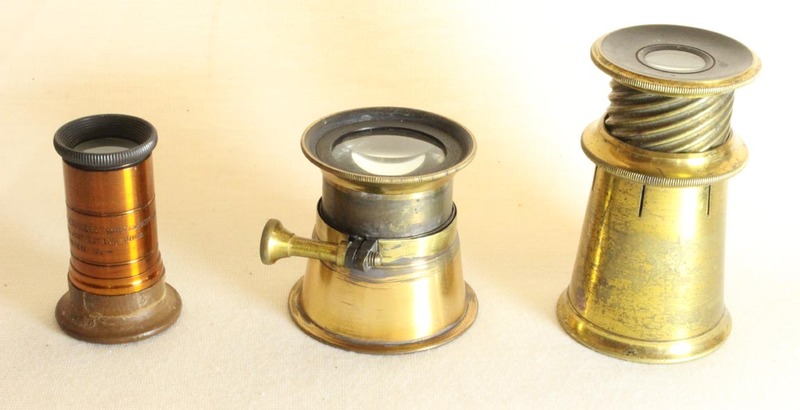 Small botanical magnifiers with a similar focusing mechanism also exist, but are different in that there is an opening from the side, or a glass surround, to allow light to enter. Yet another example of a similar instrument has two additional features. One is a round opening allowing some light to enter, but of a size that can easily be blocked off by a finger. The other is a series of calibrations, numbered from 1 1/2 through 6 1/2 with the numbered lines being 2, 4, and 6. The knurled ring, as in the magnifier in the paragraph just above this one, can lock the focus. This magnifier could, obviously be used to examine opaque objects with light entering through the cutout. Unlike the instrument in the paragraph above this one, the focus is simply by sliding though once in focus it can be locked. It is 39 mm in maximum diameter and 81 mm in maximal height; collapsed it is 54 mm in height. 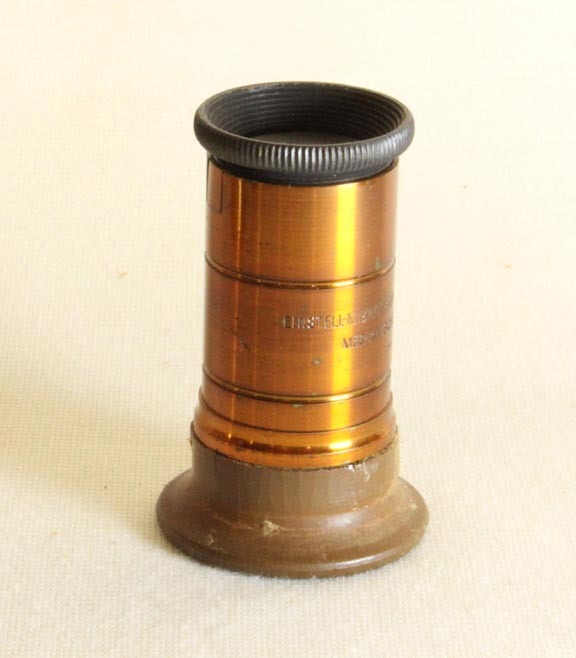 This photographic magnifier, clearly of much higher quality, and much heavier than the others listed above, was made by Ross. It is of lacquered brass with the eyecup flat black and signed. 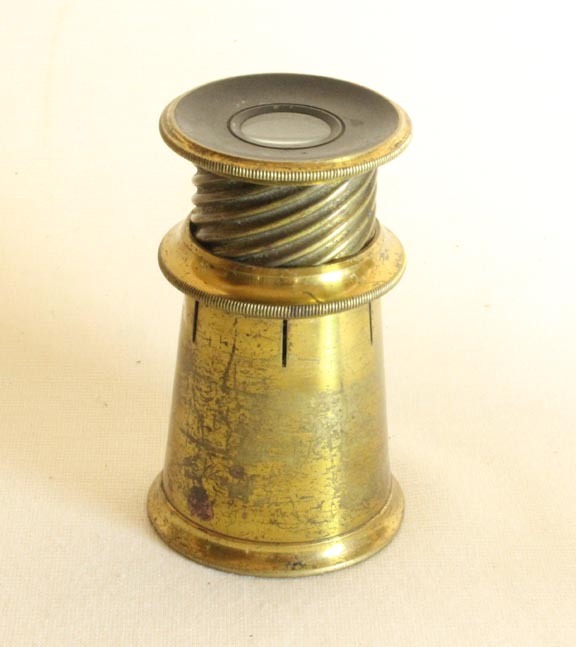 Focusing is by fine thread, and like many others, the focus can be locked by the knurled ring. It offers a beautiful large and flat field of view. It is 54 mm in minimum height, and 44 mm in maximal diameter at the knurling. The range of focus is wide and at maximal height it is 88 mm high. 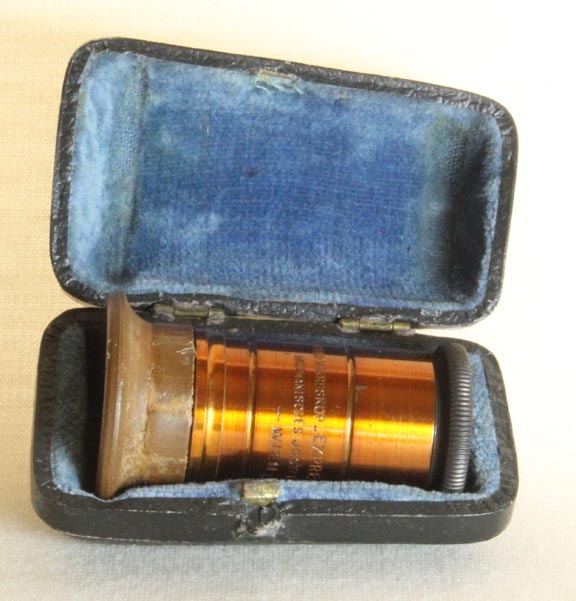 The case is embossed in gold with the signature: ROSS', OPTICIANS, 111 NEW BOND ST W. The magnifier is signed on its top: ROSS, LONDON. It fits perfectly into its case. This was the address from 1895-1911. 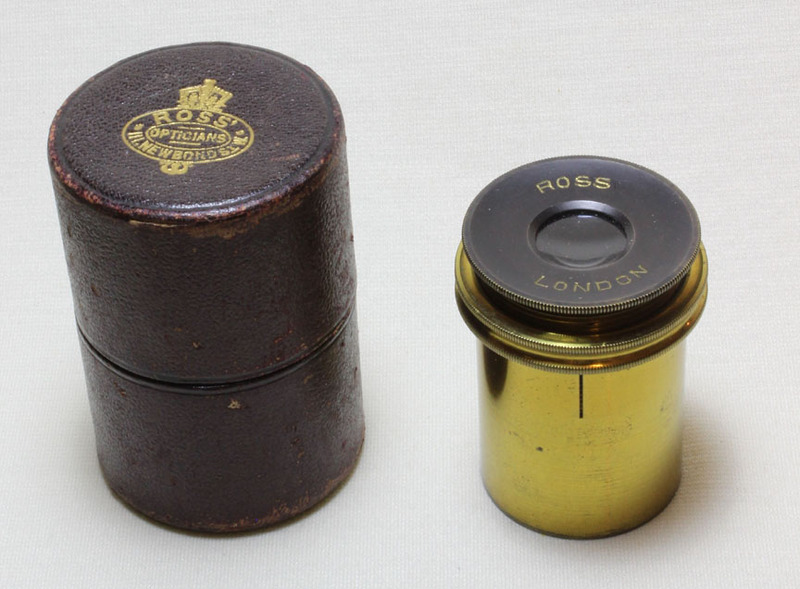 This magnifier may date to before 1897 when the name was changed to Ross ltd.